The holidays are a great time to encourage the ones you love to start preparing for emergencies. Many people won’t start preparing themselves, but a simple gift is the one that starts them down the preparedness path. Here are twelve items we have tested and recommend that are great survival tools and also useful from day to day. One of these gifts and a copy of our free 72 hour kit checklist is a great start to encourage the ones you love and respect the most. Great resource guide for the outdoorsman, prepper, or survivalist. The book goes through key facets of survival that preparedness minded person should know. Discusses a minimalist personal survival kit, multiple outdoor survival techniques including trapping, snares, foraging, water obtainment, and first aid. The new version includes newly added information on self-defense and security at home and away. Interested in a smaller version to include in a pack? Also check out the abridged 3.25” x 4.5” pack ready SAS Survival Guide here. Great option for a long lasting multi-function tool. Carry water day to day and clean the bottle in the dishwasher if you prefer. Boil water or cook food in it next to the fire during an emergency or when outdoors. It will be part of their hydration plan for years to come. Interested in a smaller or larger size? Checkout the 18oz version and 40oz version as well. Awesome present for anyone who gets cold easily or is a frequent traveler. These liners add up to 14⁰F to any sleeping bag and also can be used as a light blanket when you get chilled. Either at the office or in the airport if you get cold it will bring you some warmth. If they get dirty, just throw them in the wash. Much easier than cleaning any sleeping bag and at only 8.7oz, much lighter than adding any sheet or blanket to your travel bag. 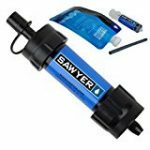 Whether it is a hike that went longer than planned, a boil water notice, or a flood that took out your water supply, this lightweight and cost effective system weighs only 2oz and filters 99.99999% of all bacteria and protozoa (down to 0.1 micron) out of up to 100,000 gallons of water. You can use the included squeeze pouch and drinking straw to filter as you drink, or screw it on to most 2-liter, 20oz water bottles, and hydration packs and use the included squeeze pouch to store and go. When you are done, backwash the filter with the included cleaning plunger and store for your next use. No expensive cartridges to replace, ever. Durable and cost effective work glove used by many today in both the military and public safety. Up to the tasks related to the daily grind of outdoorsman, policeman, and handyman alike. Keep a set of these in your bug out bag or in your vehicle for hand protection when and where you need it. A simple splinter or laceration that is not cared for properly can become infected easily and is a life threating emergency in a survival scenario. Add an extra layer of protection with these gloves. Keep both your hands free for other tasks weather they are repairing a car or walking at night to get back home. This headlamp offers great runtime, bright white light with long throw and a variable dim feature to meet your needs in any environment. A red LED is also included to ensure night visions isn’t lost when it is needed most. Checkout more details on this headlamp from our review and comparison here. A great rain suit that will keep dry without breaking the bank. At only 10.4oz, this rain suit won’t weigh down the pack. The hooded jacket can also multitask as a windbreaker to provide some thermal protection when it gets windy or cold. This suit offers a wide range of sizes to fit just about anyone and the right balance of breathability and rain protection for the price point. These gloves are a step above the rest in comfort, dexterity, and technology access. If you are typing on the keyboard, patting down the accused, or just enjoying a day at the range, they offer an extra layer of hand protection while maintaining the most dexterity, comfort, and breathability of any glove we have tried. No more taking off your gloves to access your cellphone or tablet, as this glove has touch sensitive suede in the thumb and index fingers so you can return that email or text between shots. They even offer a women’s line to ensure the proper fit for the ladies in your life. Order the women’s model here. Note: due to the form fitting of these gloves, be sure to check the fit guide by clicking here to ensure you order the correct size. Documentation is key during the flight of survival. Whether it is writing down your thoughts to keep morale high, documenting your radio communications contacts, or just a memo pad for office notes, the Moleskine Cahier Journals are up to the task. At 3.5” x 5.5” they will fit in the pack or pocket with room to spare. All emergency kits need multiple ways to start a fire. 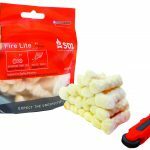 The SOL Fire Light kit provides a one handed flint striker tool and 20 pieces of waterproof tinder which stay lit for up to 2 minutes in even the worst of weather conditions. The Fire Lite Kit is lightweight enough to integrate into a personal survival kit for every day carry, or a great addition to a 72 hour Bug Out Bag. The Spyderco Delica 4 is truly a knife that will last through the ages. The lightweight yet extremely durable fiberglass reinforced nylon frame and VG-10 stainless steel flat ground blade comes razor sharp and will tackle day to day tasks and most small bushcraft tasks you throw at it while preventing rust at the same time. Though I wouldn’t recommend it for batoning, whether you are making a feather stick, cutting up meat, or even opening up packages, it is a knife that will surely fit well in anyone’s every day carry (EDC) lineup. Every Bug Out Bag should have a smokeless way to cook food. You may not always be able to have a fire to cook a meal. The Trangia Alcohol Stove can use multiple types of alcohol fuels from Denatured Alcohol, Everclear, or even HEET all which can easily be found at your local hardware or liquor store. The O-ring sealed cap even lets you store up to 3oz of fuel inside the stove, capable of boiling up to 10 cups of water with no refueling. Add in the Evernew Titanium Cross Stand (sold separately) and in a windless environment, the Trangia can boil 16oz of water in 8-10 minutes. This package is a great way to provide a personal cooking solution in a small form factor. All the items listed above are used and tested by our Talon Survival team and can be found on Amazon using the links above or in our in our Talon Survival Store. If this article was useful to you, please use our links or the store to make your purchase as we get a small commission at no additional cost to you so we can keep bringing you great content. For more gear reviews and gift ideas directly to your email sign up for our newsletter here. Or follow us on Facebook or Twitter. From all of us here at Talon Survival, we would like to wish you a happy and safe holiday season.